Pleated Filters Market size is expected to reach 326.0 million units by 2022, growing at a CAGR of 6.5% from 2015 to 2022. Increasing demand for high energy efficient and lower carbon emission devices is anticipated to drive growth over the next seven years. Increasing application scope in HVAC systems and replacement of old air conditioning systems is likely to drive pleated filters market size. Increase in infrastructure spending particularly in Middle East & Africa and Asia Pacific is expected to drive HVAC systems demand. In 2013, China, Japan and India were the leading countries in Asia Pacific for construction spending which was estimated at USD 1.78 trillion, USD 742 million and USD 427 billion respectively. This factor is likely to support an increase in demand. Stringent environmental norms by regulatory bodies such as EPA against air deteriorating quality coupled are likely to favor growth. Growing need to prevent spreading of air borne diseases is also anticipated to fuel demand. They provide an additional surface and are capable of collecting particles ranging up to 10 micron. Booming oil & gas sector is likely to favor pleated filter market growth trend. Filter cartridges provide the necessary protection and ensures that all down-well fluids are particulate free thereby ensuring protection of well permeability and maintaining continuous oil flow in the well. Growing food safety norms in the U.S. and Europe is anticipated to drive demand. The market is likely to grow on growing consumer preferences to avail safe and better quality food. Presence of substitute products to remove micro-dust particles in various applications is anticipated to challenge industry growth. Pleated air filters market was the dominant product segment with valuation exceeding USD 4.5 billion in 2014. This segment is further categorized into medium efficiency and HEPA filters market. Under air filter segment, majority volume is accounted by medium efficiency products. Growing demand for high efficient equipments coupled with minimal indoor contaminants are the major reasons responsible for pleated air filters market demand. Oil filters market accounted for more than 10% of the total demand in 2014 and is likely to witness highest gains at an estimated CAGR of over 7% up to 2022. Increasing vehicle fleet in Asia Pacific countries mainly India, Japan and China and MEA is likely to drive demand, as it is a crucial part of automobile engines. On the other hand, advancement in automobile engine technologies for cleaner oil and better energy efficiency is expected to drive innovation. Industrial applications witnessed the largest installation and generated revenue exceeding USD 3.5 billion in 2014. Industrial application segment majorly includes power, cement and metal industries involving its use. Industrial applications emerge as a leading segment on account of increasing infrastructure investments in power sector and cement industries. Stringent emission limits and HEPA (high efficiency particulate arrestance) standards are expected to further boost demand for industrial applications. Commercial applications were the second largest and accounted for more than 20% of the total demand in 2014 and likely to witness significant gains of over 6% up to 2022. Commercial application segment mainly includes schools, offices and buildings. 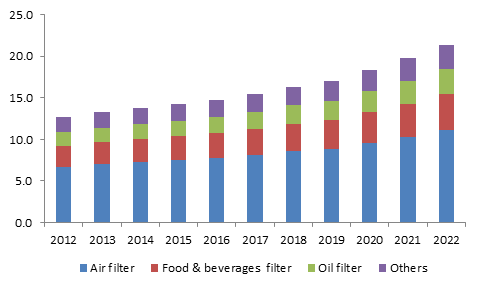 Asia Pacific pleated filters market was the dominant region with valuation of over USD 3 billion in 2014. Industrialization coupled with stringent environment regulations will emerge as major driver for demand in India and China. Currently, China pleated filters market size, at over USD 1.1 billion in 2014 is the largest regional industry followed by Japan. Europe pleated filters market share accounted for more than 22% of the total demand in 2014 and is likely to grow steadily at an estimated CAGR of over 5.5% up to 2022. The market will grow significantly on account of stringent regulations by REACH and other regulatory bodies to control harmful emissions and conserve energy. In addition, most of the power plants in Europe are aging and pleated filter technology is expected to emerge as an energy efficient alternative to old air conditioning systems. The global pleated filters market share is fragmented and is characterized by the presence of international and domestic industry participants. The industry is likely to attract new participants over the coming years owing to rapid industrialization in emerging economies. Key companies include 3M Company, Donaldson Company Inc., General Motors Company, Midwesco Filter Resources Inc., The Strainite companies, Freudenberg & Company KG, Columbus Industries, Atlas Copco and Camfil AB.